"This is not the first time that the US and Western countries have signaled their support to armed terrorist groups," Brig. Gen. Hetham Hassun, a Syrian military analyst, told Sputnik Arabic. "We witnessed similar information and diplomatic campaigns to support jihadists before the liberation of Aleppo and Homs. Now exactly the same is taking place in Ghouta. Western countries train and provide militants with weapons and essential goods; they also provide information support [to jihadists]." According to the Syrian general, the Americans are planning to turn Ghouta into a "terrorist stronghold." To accomplish this objective, they will send reinforcements from the US-held Syrian border area of At-Tanf, he noted. Previously, the Turkish newspaper Yeni Akit reported that the Pentagon had deployed 600 troops in the international coalition's base in At-Tanf in Syria. "In case it works, it will become an effective instrument to influence [Damascus], since the entire government is located in the Syrian capital," Brig. Gen. Hassun highlighted. Still, the US will not be able to interfere in the Syrian Arab Army's (SAA) Ghouta operation directly, because the region's airspace is effectively protected by Russian defense systems, he opined. That is why it is likely that the SAA will continue its advance and will finally expel terrorists from the area, the general emphasized. He noted that while Western mainstream media are circulating photographs from Ghouta, they remain silent about the situation in the towns of al-Fuah and Kafriya in the Idlib governorate, where people are suffering and dying under the rebel siege. 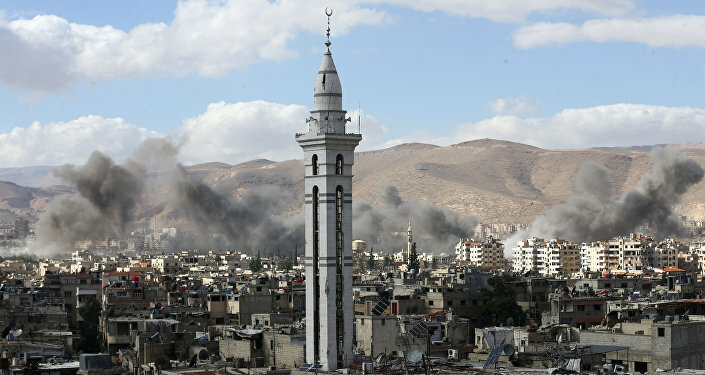 "It is not only they who are suffering from the siege," the Syrian military analyst pointed out. "As Russian Foreign Minister S. Lavrov said, the United States facilitated the siege of the Rukban refugee camp, At-Tanf, and the city of Raqqa. Humanitarian organizations are not allowed to access these areas. Dead bodies still remain buried under the rubble in Raqqa." Brig. Gen. Hassun opined that Washington wants to take advantage of the situation in Ghouta to blackmail Syria and Russia to achieve their political and military goals. On the other hand, the Americans cannot benefit from the controversy over al-Fuah and Kafriya, as they would have to accuse countries backing terrorists who imposed the blockades on the towns. "How can the US condemn Turkey, European countries, the Persian Gulf states and themselves [for the siege]?" the general asked rhetorically. 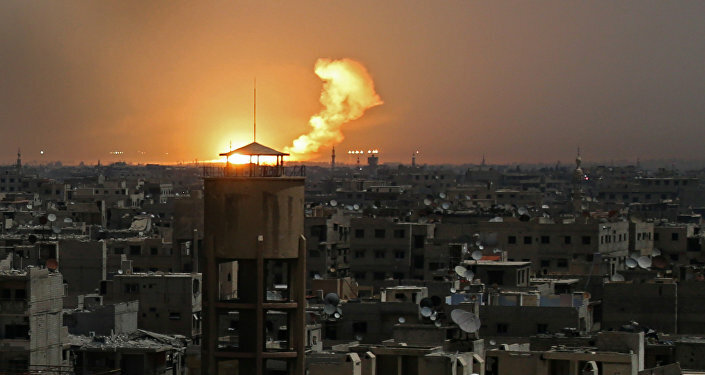 Meanwhile, the fourth five-hour "humanitarian pause" took place in Eastern Ghouta on Friday. The Russian Center for Syrian reconciliation reported that Syrian civilians complain about the lack of medical care, water, food and electricity, which are being blocked by extremists. "People do not have an opportunity to eat properly, and many are ready to resort to eating stray animals," the center's interpreters' department head Aleksandr Maslennikov told reporters. On February 24, the UN Security Council unanimously adopted resolution 2401, which envisages a 30-day ceasefire across Syria. For its part, Russia has introduced five-hour humanitarian pauses in Eastern Ghouta and opened corridors to evacuate civilians. However, militants are not allowing local residents to flee the area. Being occupied by extremists and opposition forces since 2012, Eastern Ghouta occupies an area of about a hundred square kilometers with the pre-war population reaching 400,000 people. The views and opinions expressed by Hetham Hassun do not necessarily reflect those of Sputnik.